How does studying lake sediment cores help scientists uncover past climates? Researchers take cores of trees, corals, ice, ocean floors, and lake sediments to learn about past climates. The cores give "proxy" information about the past. A proxy speaks for someone else and in the case of past climates proxies (ice cores, tree cores, and lake cores) speak for what was taking place thousands or millions of years ago. For example, a burn scar in a tree core can "speak" about a fire that came through the forest years ago. Researchers are able to count the rings or layers to gain insights in to how long ago the proxy took place. In the case of lake sediments found in the Valles Caldera, scientists have an excellent record of plant pollen which tells us what kinds of trees, shrubs and grasses were growing in the area. Since there are some plants that prefer warm conditions and some that prefer cooler conditions, scientists can look at the proxy data and reconstruct past climates (paleoclimates) from the core sediments. Research data: Fawcett, P.J., J.P. Werne, R.S. Anderson, J.M. Heikoop, E.T. Brown, M.A. Berke, S.J. Smith, F. Goff, L. Donohoo Hurley, L.M. Cisneros-Dozal, S. Schouten, J.S. Sinninghe Damsté, Y. Huang, J. Toney, J. Fessenden, G. WoldeGabriel, V. Atudorei, J.W. Geissman, and C.D. Allen. 2011. Extended megadroughts in the southwestern United States during Pleistocene interglacials. Learn how to use scientific data to understand the Earth's systems by interpreting the graphs and charts. Under Labs and Activities you'll find a student lab sheet for students to interpret graphs showing different pollen counts over time and learn more about how pollen is used as a proxy. 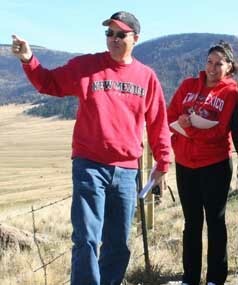 Peter Fawcett received his PhD from Pennsylvania State University in the study of past climates (paleoclimatology) and he is a professor at the University of New Mexico. He is conducting research in the Valles Caldera to find out how climates have changed over time and how one might use this research to understand future climate change. In Dr Fawcett's research, it is important to know about how the Earth systems are interconnected and how these interactions impact the geochemical cycles, plate tectonics, and atmospheric and oceanic dynamics, and in turn, how they impact climate. Fawcett and his colleagues are analyzing sediment cores for proxy data; such as plant pollen, ash deposits, and isotopes to reconstruct past climates. Dr. Fawcett's reconstructions of climatic influences will be important to understanding the impact of anthropogenic climate change and the future of the arid Southwest. SERC Palentology How can we infer past climates?